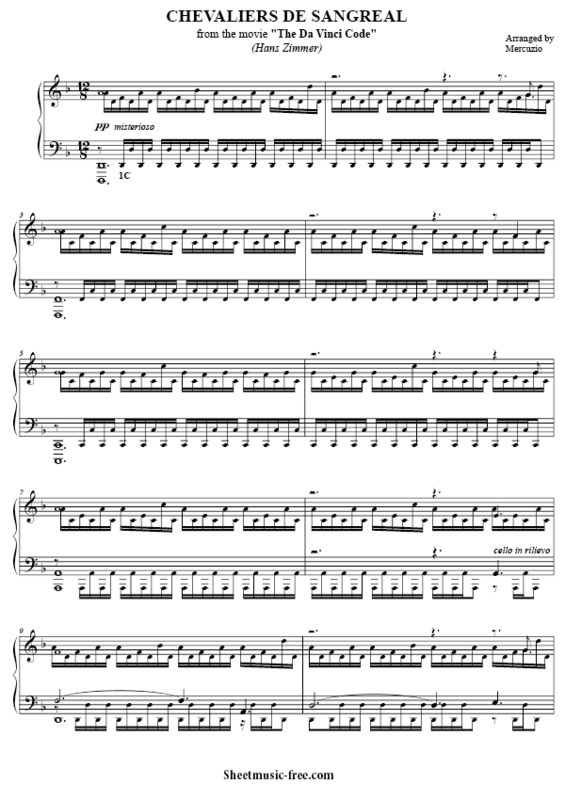 “Chevaliers De Sangreal Sheet Music” by Hans Zimmer, “ Chevaliers De Sangreal Sheet Music” for Piano / Vocal/ Guitar Chords , Original key: F Major, number of pages sheet music PDF: 5, Video song Chevaliers De Sangreal Sheet Music. “Chevaliers De Sangreal’” “Hans Zimmer” song of the Film The Davinci code. Chevaliers De Sangreal Sheet Music Hans Zimmer. The official motion picture soundtrack for The Da Vinci Code with Thomas Bowes (violinist), King’s Consort Choir, Hugh Marsh, Orchestra, Richard Harvey, Hila Plitmann, Martin Tillman was released on May 9, 2006 via Decca label. The film’s music was composed by Hans Zimmer, whose work resulted in a nomination for the 2007 Golden Globe Award for Best Original Score. For a soundscape that was religious to the core, Zimmer used a massive orchestra and chorus to create a dramatic ‘stained glass cathedral’ feeling. While the score has more in common with Zimmer’s previous work for Hannibal, there is also a solid mixture of the motifs used for The Thin Red Line and Batman Begins. The thirteenth cue, “Chevaliers de Sangreal”, is the most bombastic; powerfully underscoring the ‘discovery’ scene in the film. Like Media Ventures protégé Harry Gregson-Williams, who composed the soundtrack for The Lion, the Witch and the Wardrobe, Zimmer used Abbey Road Studios to help create his music for The Da Vinci Code. Additional sections were recorded at London’s AIR Studios, atop Rosslyn Hill. It was rumored that the A-ha song Celice would be in the soundtrack to the film so that song is a double entendre for the torture device, the cilice, and the name of a woman named Celice whose presence seems to torture the men, but this did not occur.